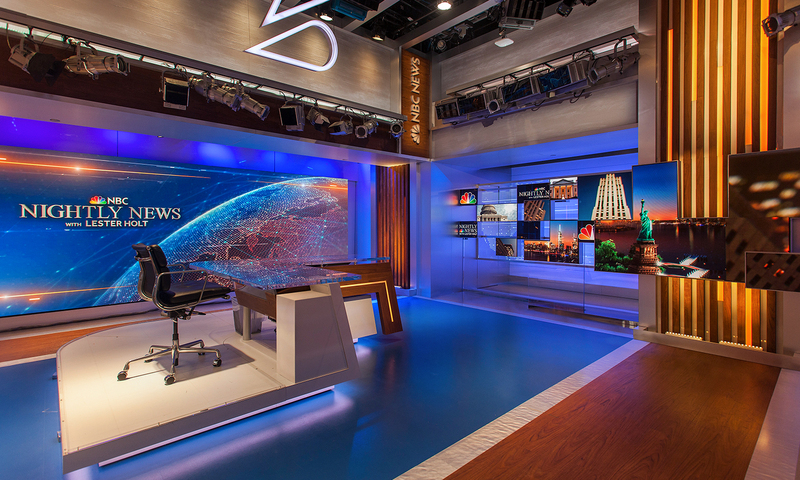 Objectives for the new NBC Nightly News studio were three-fold: a refreshed look, a new location (Studio 3C), and a visual connection to the neighboring newsroom and MSNBC Studio 3A. 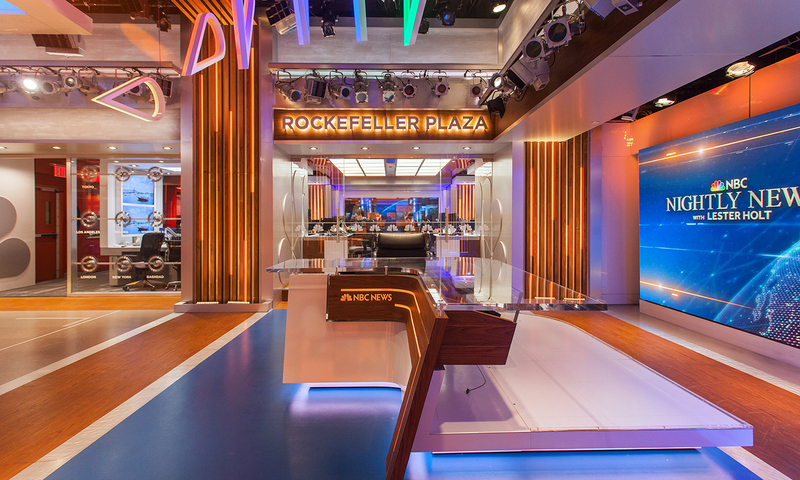 NBC’s home at 30 Rock is iconically associated with the brand, so aesthetically Clickspring’s aim was to create a modern and clean space while still evoking the visual language of Rockefeller Plaza. The color and material palette is constrained to white, metal, and teak, with pops of color coming from embedded LED and solid blue. 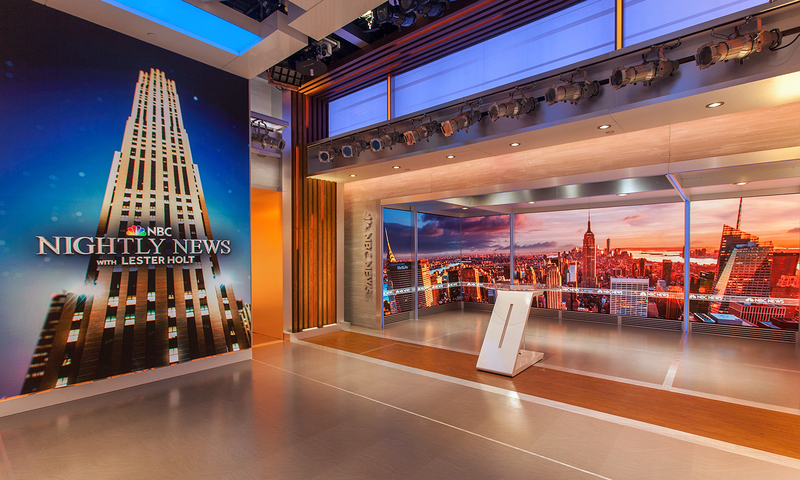 The set is infused with a sense of permanency by the use of board-formed concrete texture and glass, while details such as extruded typography and a variation on fluted columns give a nod to Rock Center’s Art Deco vernacular, but with a decidedly modern twist. 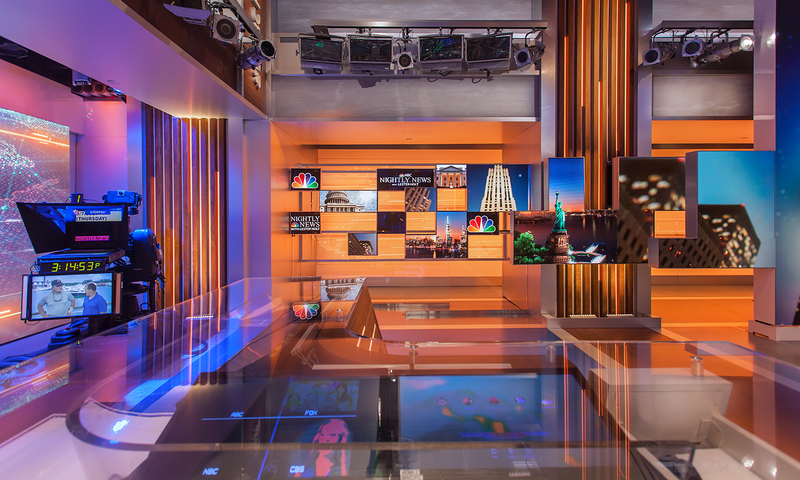 Studio 3C is a relatively small space with a high ceiling, so maintaining camera flow and depth was essential to the design concept. 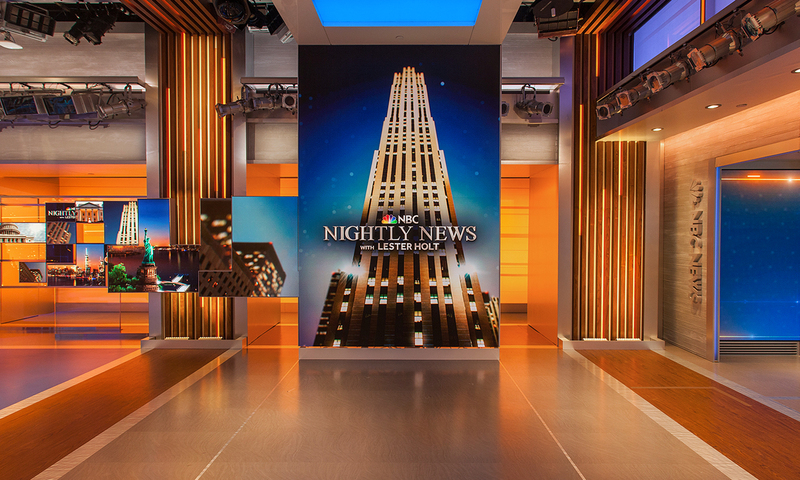 The ceiling height is accented by the tall columns that fold into canopies and by a double-height LED display that becomes the visual linchpin for the opening of the broadcast each night. 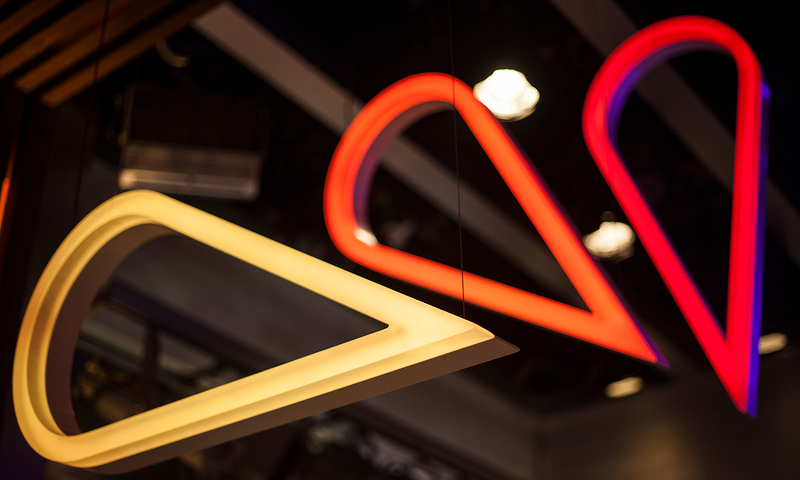 The screen is visually “constructed” from a collage of smaller LED tiles camera left that merge compositionally as they approach the LED “tower” on the right. 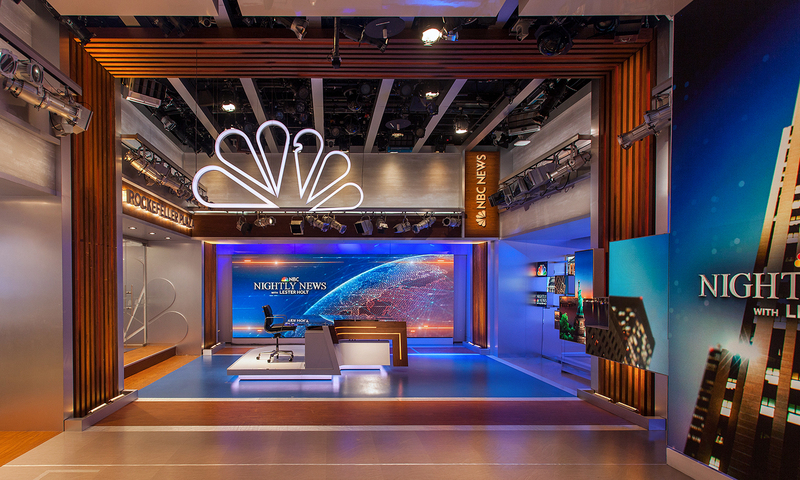 The metaphor here is a simple one: that NBC is a trusted source that ingests the day’s stories and crystalizes them into the essential information for each broadcast. 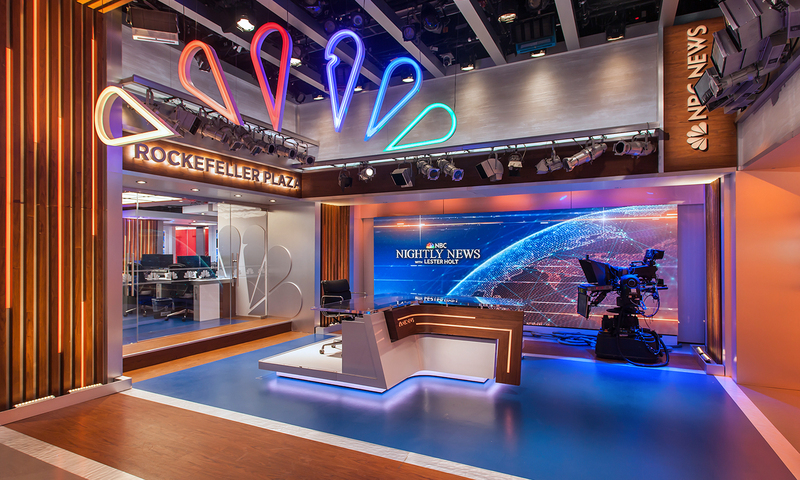 The network’s peacock logo is also suspended from the ceiling, deconstructed into its individual “feathers” as an anamorphic installation. As the jib camera swings to a specific position, the feathers align in perspective, resolving into the complete logo. 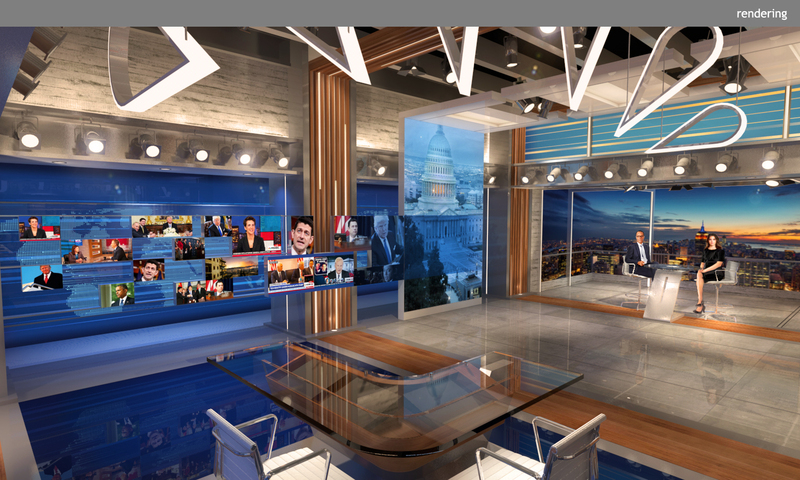 Demolition of the solid wall between 3C and 3A allows both studios to use the editorial newsroom in between as a connection point and visual backdrop. The two are separated only by sliding glass panels and doors, so the depth on camera is tremendous. 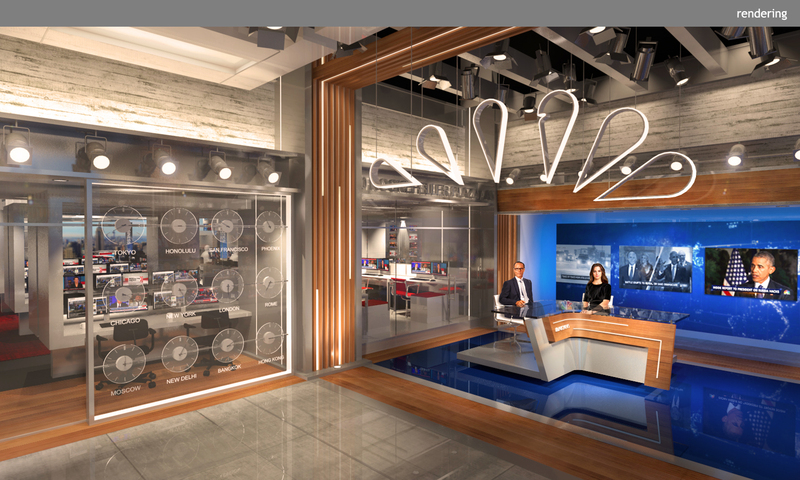 What was a fairly dark portion of the newsroom is now open and bright, and occasionally its staff become background members of the broadcast.